It is my pleasure to introduce to you fellow SHINE sister and frequent poster here on SHINE, Rebekah Vepraskas. Rebekah and I go way back. Way, way back. I love the guts out of this girl. She's the kind of friend that is always in tune with the Holy Spirit. Yes, like always. She's also the kind of friend that when she says she will pray for you, not only will she pray for you, but she will PRAY for you! Seriously, she does. Be blessed by Rebekah's post today. Grab your coffee and soak in the wisdom, friends. 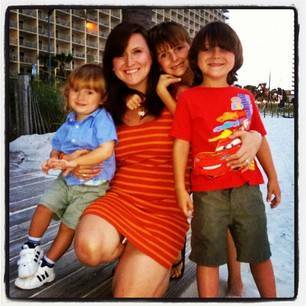 here is Rebekah and her handsome boys! I have been puzzled by certain thoughts lately… it's been really weird. I’m sorry, indulge me. I have been thinking about how as modern day women, we have all of these accoutrements or items to prepare us for any inconveniences, elements or problems. We have glass cleaner for foggy glass. We have a vacuum for crumby floors. We have bibs and diapers to help us control definite messes to come with our babes. We even have seat belts to keep us safely in our seats. (Not to mention the little bell that rings if someone forgets to buckle up!) Somehow, God created our faces to hold glasses… with ears at the perfect angle to hold on spectacles enabling us to see or be protected from the sun. Frankly, we are prepared for almost any obstacle life throws our way. Nothing. He said nothing to me and I began to run through in my mind all of the preparation I went through to get ready: shower, blow dryer, make up, coffee maker, travel coffee cup and a purse to carry around anything else I may need… My thoughts ran away with me and I was still confused. I began to shake my head, I closed my Bible and I began to cry. Now, listen to this~ Our sweet mother had us recite this long prayer every morning as we started our day, which included the armor of God. I know this passage of scripture by heart. A passage of scripture that I have not dusted off in at least 20 years. Many of those years, I have faced life more or less unprepared, spiritually. Not anymore. 10 Finally, be strong in the Lord and in his mighty power. 11 Put on the full armor of God, so that you can take your stand against the devil’s schemes. 12 For our struggle is not against flesh and blood, but against the rulers, against the authorities, against the powers of this dark world and against the spiritual forces of evil in the heavenly realms. 13 Therefore put on the full armor of God, so that when the day of evil comes, you may be able to stand your ground, and after you have done everything, to stand. 14 Stand firm then, with the belt of truth buckled around your waist, with the breastplate of righteousness in place, 15 and with your feet fitted with the readiness that comes from the gospel of peace,16 In addition to all this, take up the shield of faith, with which you can extinguish all the flaming arrows of the evil one. 17 Take the helmet of salvation and the sword of the Spirit, which is the word of God. These are my notes from the incredibly enlightening service and some more grown up reflections about the Armor of God. 1st) By putting on the belt of truth: because truth is the foundation of our lives. 2nd) Then the breast plate of righteousness: because this is how are hearts are protected. 3rd) Next our feet are covered with the Gospel of Peace: because we need His peace wherever we go. 4th) Paul explains that our we are to take up the Shield of Faith: because it protects us and keeps us safe. This is the best part! 6th) Finally, we take up the Sword of the Spirit: because, Paul explains, it is the word of God. THIS WAS WRITTEN BEFORE THE BIBLE EXISTED IN IT’S CURRENT FORM. Here, we can refer back to the gospel for an explanation of what Paul is saying. As a counselor, I am entering crisis situations every time I meet with a patient. Sometimes, several times a day. I cannot tell you what a comfort and difference it makes to enter these situations with the armor of God to protect every vulnerability I have in my life. I encourage you to ask the Holy Spirit about the significance of the armor of God in your life!